Russian opposition supporters put on a resilient face as they continued their calls for a government change in the Kremlin and wide sweeping reforms. Around 7,500 people huddled under an evening drizzle on the outskirts of Moscow Sunday for a series of keynote speakers topped by opposition front-man Alexey Navalny. “My ‘plan’ is to remain a decent person,” said Navalny in answer to criticism by pro-Kremlin pundits. Navalny detractors say that without a detailed political plan he, and the opposition at large, should not be calling for a change in government. “All of us here believe that the truth is more powerful than lies, and that a decent person who speaks the truth is more powerful than a liar,” he added to the largely stoic crowd. The rally also demanded an end to corruption and the release of political prisoners. It came a week after nationwide local and municipal elections wholly dominated by United Russia, the party of President Vladimir Putin. “They were a failure because of apathy,” said attendee Anna Litvenenko of the Anti-Corruption Fund. “People don’t see another side of life so they give into it,” she continued. Fellow rally-goer Zakhary Gerchakov was pessimistic this apathy would disperse. “It’s a dilemma between the refrigerator and the television – so long as there is food in the fridge, people will believe the television,” he said pointing to the effectiveness of Kremlin propaganda. Organizers originally had planned for an attendance of 40,000. 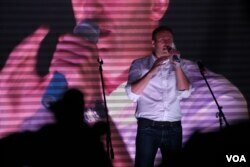 But despite the low turnout, Navalny promised to keep fighting.